Regardless of what vegetable crop(s) you’re growing or on what acreage, it takes vision and a plan to move from seed to start to planting, harvest, and sales. It takes record-keeping and analysis to determine if a crop is worth your time to grow, or how you might make it worthwhile. Join us for an evening with Becky Zaneski as she brings The Joy of Farming with Spreadsheets to life. From season planning and field mapping to tracking labor costs and sales data, Becky’s common-sense approach helps you make sense of the data. Co-founder of City Grown Seattle, an urban market gardening business, she is a farmer with a strong software background and a passion for growing vegetables. 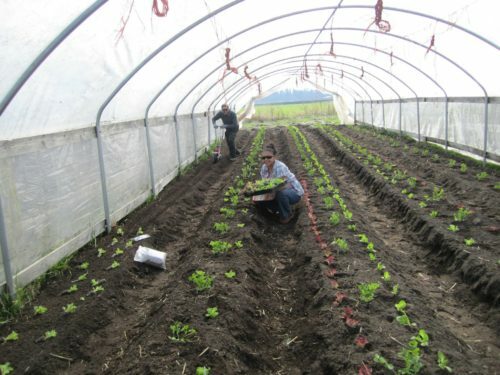 She currently farms at Full Tilth Farm in Poulsbo, a 5-acre farm producing vegetables, berries, and eggs using organic practices…and spreadsheets! Visit GrowYourFarm.eventbrite.com or download this form and mail with your check. For more information on the workshops, contact Kate Ryan, kate.ryan@wsu.edu, (425) 357-6024. Grow Your Farm workshops are sponsored by WSU Snohomish County Extension and the Snohomish Conservation District. Extension programs and employment are available to all without discrimination. Evidence of noncompliance may be reported through your local Extension office or to the WSU Center for Human Rights. Persons with a disability requiring special accommodation can request accommodation 21 days before training at (425) 338-2400. If accommodation is not requested in advance, we cannot guarantee availability on-site.